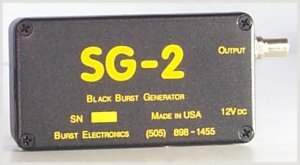 The SG-2 Black Burst Generator is a single output unit. The output, which contains composite sync, color burst and 7.5 IRE setup (0 IRE in PAL) is a standard 1 Volt Video signal. The SG-2 is used to drive Genlock inputs, laydown "black" on tape, or feed a DA to distribute house black. Second Generation: A redesign of one of our best sellers. Now the waveform is digitally generated under microprocessor control, providing precise purity.